Before you use a flea and tick preventative on your cat, it is imperative that you make sure you are using the right product. Preparations formulated for dogs, even toy breeds, contain pyrethrins or pyrethroids, which include tetramethrin and cypermethrin, the insecticidal ingredients that kill fleas and ticks. These ingredients pose a high level of toxicity in your cat. Some over-the-counter flea and tick control products labeled for use in dogs and cats contain them. Chose only veterinarian-recommended products specifically formulated for cats in order to prevent a potentially fatal tragedy. Pyrethrins are natural toxins derived from pyrethrum plant varieties, including the chrysanthemum cinerariaefolium. Tetramethrin and cypermethrin are longer-lasting synthetic agents that perform the same purpose as pyrethrins, which is to kill fleas and ticks. The collective group of synthetic pyrethrins is called pyrethroids. Other examples of pyrethroids are fluvalinate, permethrin, allethrin, deltamethrin, phenothrin, entofenprox and fenvalerate. Cats are particularly vulnerable to these substances because their physiology prevents them from safely metabolizing the toxins. Always scrutinize the labels of flea and tick control products. Exposure can result in toxic reaction as these ingredients target the feline nervous system. Cats treated with tetramethrin, cypermethrin or the similar ingredients will experience muscle tremors, seizures and failing coordination. Other symptoms may include twitching, excessive salivation, weakness, agitation, vomiting, diarrhea, shock and respiratory distress. Failure to promptly seek emergency veterinary care can result in death within a few hours. Cats likely to be particularly susceptible to these effects include young kittens, geriatric cats, sick cats and those whose body temperatures were low at the time of application of the flea and tick control. If you notice symptoms of toxicity or any other changes in your cat’s behavior after administering a flea and tick preventive, bring your cat to a veterinarian at once. If the preventive was in the form of an all-over topical insecticidal spray or mousse, it will be essential to wash off as much of the product as possible. The vet may recommend a bath even if the topical product was a fast-absorption liquid administered to the back of the neck. For a mild reaction, veterinary staff may bathe Kitty with a liquid dish detergent to strip what's left of the topical product from her skin and fur, and will keep your cat under observation for a few hours. For more severe reactions, the bath may have to wait until the cat is stabilized with fluid therapy, anti-seizure medications and supportive care in the hospital. Your veterinarian is your best resource for safe and effective flea and tick control. 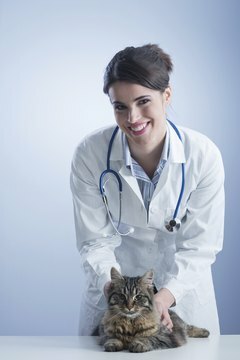 Numerous prescription products are available in topical and oral preparations that you can safely administer to your cat in accordance with her age and weight. Be sure to follow your vet's dosing and application instructions carefully. If you are treating a canine family member for fleas and ticks, keep the dog and his feline friend separated until the applied product is dry.